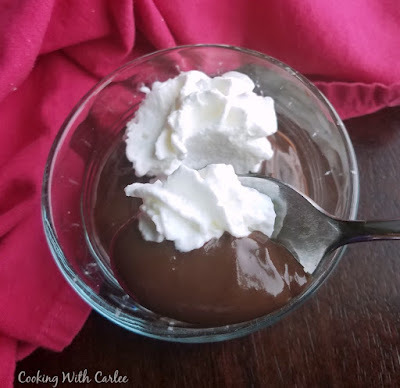 Creamy smooth and luscious, this homemade chocolate pudding is comforting and delicious. It is easy to make with pantry staples and definitely worth the effort! Sometimes you just want a little chocolate pudding. There is just something so comforting about it. Now, you could run to the store and buy a box of mix. Then all you have to do is stir in the milk and let it sit. Or you can do something that is almost as easy and tastes twice as good. Chances are you have most of the ingredients in your pantry already, and as a bonus you get to sneak a little warm pudding to tide you over until it cools! In my book those are all wins! This pudding's chocolate flavor is so deep and delicious. I added some instant coffee to really round out the chocolate flavor, though you certainly don't have to. It is sweet enough, but not too sweet. It is smooth and luscious and a perfect treat that will remind you of childhood while still pleasing your adult pallet. Making the pudding really isn't hard at all. You just whisk together the dry ingredients, then the cold milk. This next step is time consuming, but easy. Just get comfortable and ready to hang out over the stove for a little bit. You want to bring up the temperature of the milk slowly until the pudding is thickened. True, it may take ten or fifteen minutes, but the results are worth it! Besides you waste time on much sillier things than that! Just when it seems like it is never going to happen, the mixture starts to thicken. All of the sudden it goes from seemingly a lost cause to really moving fast. 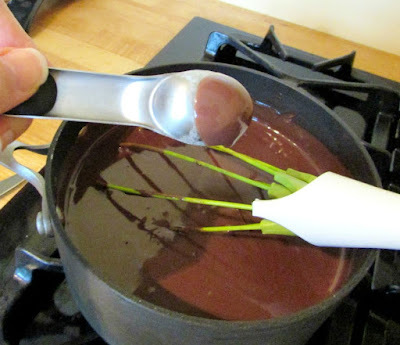 Once it seems like it is reaching pudding consistency, check to make sure it really coats the back of a spoon. All that is left is stirring in the butter and vanilla, a quick taste test and off to the fridge. See, that wasn't so hard! In addition to being a great snack on its own, it is also a great building block to other treats. I used some in the ghosts in the graveyard trifle to make it extra special. You could also pour the warm pudding in a baked pie shell and chill it. Top it with some cream cheese whipped cream for an extra special treat! In a large heavy bottomed saucepan, whisk together the sugar, cocoa, coffee, corn starch and salt. Add 1 cup of the milk and whisk vigorously until smooth. This is your chance to get all the lumps out. Whisk in additional milk. Place pan over low heat and whisk VERY frequently for the first five minutes. Be sure to get the edges of the pan, you don't want anything to scald. After 5 minutes, start whisking constantly. It is important that you don't lose your patience and turn up the heat, it will thicken. Once the mixture is thick enough to really coat a spoon, remove from heat and whisk in butter and vanilla. Follow Cooking With Carlee's board Sweet Things on Pinterest. Your homemade chocolate pudding looks so good. If I am in the right mood I find stirring pudding or risotto or anything like that to be relaxing and fun... the pudding is a great bonus at the end! Thanks so much for hosting! I don't tend to make it much during the spring and summer, so it had been a while for me too! There is something so satisfying about making it from scratch. Of all the dessert I make, I have never made homemade pudding. Definitely must try! It is really easy and so good! A little chocolate is good for the soul! Oh man...this sounds SO amazing! I've pinned it! YUMMY! Thank you for hosting! Pudding was definitely a childhood favorite of mine so i have to make some every now and then! This recipe looks so delicious and easy to make! Pinning! Thanks for sharing at Inspiration Thursday! Thank you! I enjoy making it and really enjoy eating it!! Thanks for hosting! Sounds fantastic! I love chocolate pudding but definitely don't eat it enough. Thanks for the recipe! Pudding is definitely one of those simple pleasures. I don't think to make it that often either, but really do enjoy it when I have it. Here from Miz Helen's and your pudding looks and sounds like one I would really like. I'll make it for dinner tonight....thanks. How exciting! I hope you love it! Hi Carlee, Ooh homemade pudding sounds yummy. Would love for you to come link up with us tonight at 7pm EST at Throwback Thursday link party! Visit us at http://tornadoughalli.com or http://dadwhats4dinner.com to link up! Can't wait to see you there and invite your friends! Thanks Quinn, I stopped by! Pinned! Thanks for sharing with us at #Throwback Thursday link party. Please join us again next week and invite your friends to join. Have a great week! 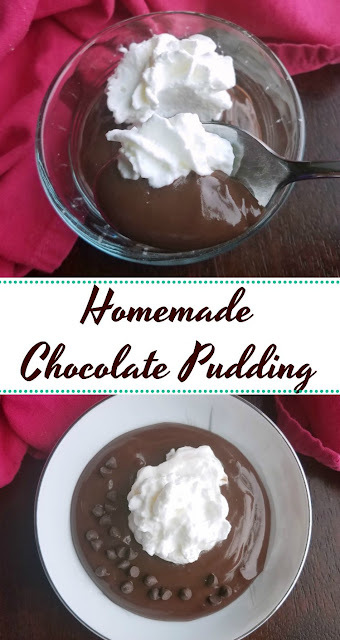 Homemade chocolate pudding is the best, this looks wonderful! Thanks for sharing at What'd You Do This Weekend?! oh how I love homemade pudding! I have to ration it or else I will eat it all and this pudding looks like I might eat it all before it even makes it to the fridge! This would be perfect in an after dinner parfait for dessert! Thank you for linking up with us at the Tips and Tricks Link Party! I cannot wait to see what you have in store for us this week! I know, I find warm pudding to be super dangerous too! I love the idea of a parfait too. Thank you so much for hosting! OOOH! Would this be good in a pie as well? Yummy! Thanks for sharing on My 2 favorite Things Link Party!! Come back again!! Pinned! I would certainly think so! It thickened up really nicely, so I don't see why it wouldn't work. Thanks so much for hosting. Mm mm mm. 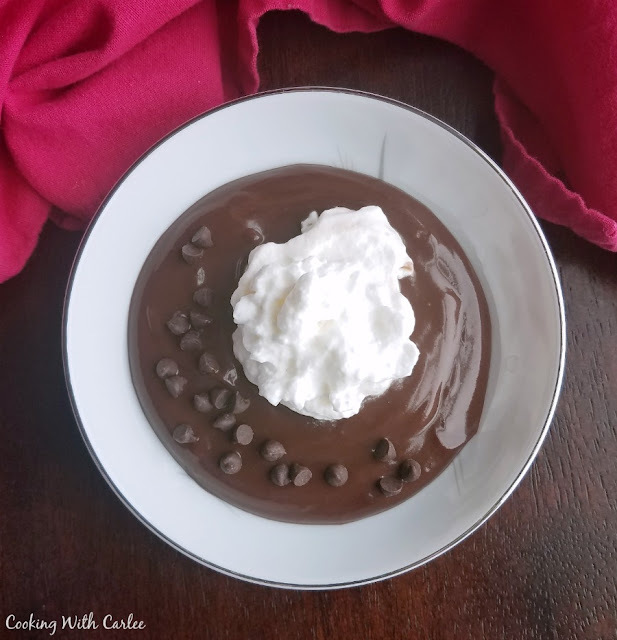 Chocolate pudding is one of my favorite comfort desserts. That and tapioca. Love this recipe. Thanks for bringing it to #SaucySaturdays. I love tapioca pudding too! Top two puddings for sure! Thank you! It really was good and I love that whisk. 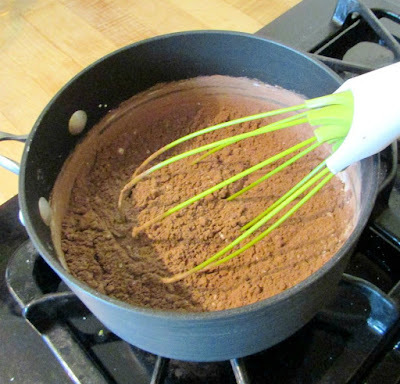 You can make it a flat whisk as well! Hi Carlee, you're a bad, bad lady posting this now! Seeing recipes like this is not going to help me get my sugar consumption in check!... The addition of coffee granules really does bringout the taste of chocolate in a cake without an obvious coffee taste. I do lookforward to trying this recipe. Maybe in a few weeks though. Yep, I saw this on Twitter and I was like YES, I pretty much want to dive into the bowl! Look delicious and comforting! Stay warm and cozy beautiful friend! It looks like we are in for a warm up next week. It is supposed to be a whole 35 degrees!! In the meantime I think we should cuddle up under cozy blankies and eat pudding! This looks so rich and lush! I have a chocolate pudding recipe which uses egg yolk and there is too much of effort that goes into making it! I love this! It's so simple and looks so good! Mmmm, I love a good custard too. But I do like how simple this one is and soooo scrumptious. Thank you, Deepika! Yum, I make chocolate pudding and homemade hot chocolate every week but I hadn't thought to put coffee in it, trying that next. Thanks for the idea! Just a little bit really gives that chocolate flavor a boost. I hope you love it! I've never made homemade pudding. You're recipe makes me want to give it a try. I think my kids will love it. It is so easy and creamy and delicious! You had me at luscious and chocolate hehehe. Thanks for sharing at Friday Frenzy Link Party! PINNED! It so creamy and smooth too! So many great adjectives for a fun treat! Chocolate pudding is worth waiting for! What a delicious recipe. I am craving some now. It definitely is worth the wait! Thank you! Nothing beats homemade chocolate pudding...NOTHING!!! Ha! It is definitely way up there! I will have a large serving please, oh my it looks delicious! Thanks so much for sharing your post with us at Full Plate Thursday this week. Hope you have a great day and come back soon! Sure thing! There is just something so soothing about pudding, isn't there?